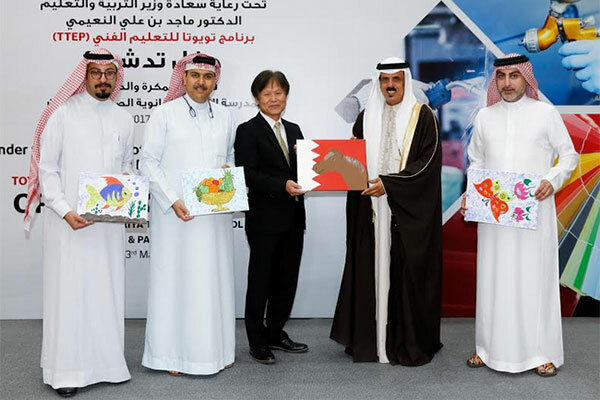 Ebrahim K Kanoo, sole distributor of Toyota vehicles in Bahrain, has opened the second Toyota Technical Education Programme (TTEP) at a ceremony held at Al-Jabriya Secondary Technical Boys School in the kingdom. The event also saw training materials and equipment donated to the school. Held under the patronage of Minister of Education, Dr Majid bin Ali Al-Noaimi, the event is part of a global Toyota Motor Company (TMC) initiative aimed at recruiting young local talent from vocational schools and educational outlets worldwide and inducting them into the Toyota network. The donation included textbooks, car panels and bumpers, spray guns and a Lexus IS250 training vehicle, all of which will be used to provide hands-on skills training for students looking to pursue a career in the automotive industry. The activity falls in line with Ebrahim K Kanoo’s Corporate Social Responsibility strategy, which focuses on education and youth development. The company has employed a large number of talented students over the years through similar initiatives. The ceremony was attended by Dr Al-Noaimi, Ministry of Education, Undersecretary for Curriculum, Dr Fawzi Aljowder, assistant undersecretary for General Education, Latifa Al-Bonoutha, director of Technical and Vocational Education, Dr Mohammed Abdul-Razzaq Al-Siddiqi, Toyota Motor Corporation – Bahrain Representative Office (TMC–BRO) general manager, Yoshiyuki Koike, Ebrahim K. Kanoo board members, school headmaster Sayed Redha Alawi, and other school staff members.